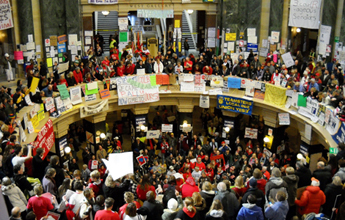 Wisconsin citizens occupied the state Capitol for weeks in protest of Gov. Walker's proposals to strip bargaining rights from state workers. The overwhelming 61-percent vote in favor of an Election Day referendum in Ohio that overturned Gov. John Kasich’s bill restricting collective bargaining for public employees inspired workers all over the U.S. But nowhere were workers more excited than in Wisconsin, where, this year, Republican Gov. Scott Walker succeeded in pushing through an anti-collective bargaining measure despite a walkout of Democratic state senators and a recall effort that removed two supporters of the bill from public office. On Nov. 15, labor and community activists in Wisconsin launched a petition campaign to recall Walker with a splash of creative tactics that drew widespread media coverage. The campaign follows an overwhelming vote by building trades crafts who work in the public sector to recertify their unions. Recertification votes were one of the requirements of Walker’s anti-collective bargaining measure. From a midnight pajama party in a Madison bar to a rally in front of Walker’s home, volunteers , many of them part of coalitions We Are Wisconsin and United Wisconsin, launched a signature-gathering effort to put Walker’s recall before the voters next year. They have 60 days to gather some 540,000 signatures. Also targeted in the petition campaign will be Lt. Gov. Rebecca Kleefisch, who was elected with the support of the Tea Party. In order for Wisconsin to have a strong middle class, we need to change direction. Over 65,000 Wisconsinites, half of them children, are being kicked off Medicaid; 40 percent of our children’s classrooms are increasing in size; working families are being made scapegoats for budget situations they didn’t create and family-supporting jobs are not being created at the rate Wisconsinites expect. This is not the Wisconsin way and the citizens of the state have taken it upon themselves to change course. At a November 19 kickoff rally for the recall campaign on the state capitol’s steps, petitioners will also be collecting food in a “can Walker” food drive to benefit area food pantries. The recall campaign will be a pure test between grassroots volunteers and unlimited corporate and other big money contributions. Walker can bring in as much money as he can. The unions and our allies need to involve enough volunteers to neutralize the big bucks. Six unions held recertification votes under the new collective bargaining law. The Wisconsin State Building Trades Crafts represent over 400 members statewide, including electricians, plumbers, sheet metal workers, painters, carpenters, welders and more. This is direct proof that union members know the value of unionization. Even with the attempts to suppress the vote of union members that [the bill] enacted, union members showed that once you are in a union and see its value, you don’t want to lose it. Many times this past year, we have heard politicians state that union members don’t want to be in a union. We now see that lie for what it was. ..This election shows that Wisconsinites value working families, a fair voice at work and the right to belong to a union.